Metropolis is undergoing a change, from a city of history, to one embracing the future and this discarding of heritage is something that doesn't sit well with Superman. The most stirring symbol of that change is the Daily Planet building, a beacon for truth and justice, being demolished only to be replaced at a new location sporting a look, a twelve wing, multistory, quad helipad, chrome and steel behemoth topped with a shiny metallic Planet globe. The change, a necessity of the new digital age. The changes aren't just a facelift, they are thrust upon the Planet's�readership�and Metropolitans as a whole. The Daily Planet has been purchased and merged into Galaxy Broadcasting Systems to become the Planet Global Network (PGN), the brainchild of new owner Morgan Edge. A celebratory opening that young upstart reporter Clark Kent, is�conspicuously absent from. Jimmy Olsen and Miko, the outside broadcast team are recording the demise of the original Daily Planet and Miko spots Superman mourning the loss and promptly broadcasts it over the social networks. Meanwhile at the newly constructed 'Astrodome' the night shift notice a small fire on the security cameras. While one goes to investigate, the other watches the announcement of PGN. Superman overhears the spiel from Morgan Edge and angrily brushes it off. "Bull" he sneers thinking back to a chat with Lois. Miss Lane is now head of the TV and digital division of PGN and Clark is more than a little angry. Despite Lois insisting print is dying, Clark snubs her and demands to know if the PGN merger is at a cost to their integrity. Lois doesn't back down insisting her integrity as a journalist was exactly why she took the new job, so that the Planet could live on NOT as a scandal mongering rag. She flips the question back at him. If he was so interested in integrity, why hadn't he accepted the offer to take Lois' old job as a news anchor?�Clark turns his back on Lois insisting he doesn't have to be part of a dog and pony show to do good and promptly walks out. William McCoy, Lois' replacement on the nightly news is continuing to report back on the evening's events and the security guard in the Astrodome is bored to tears while his colleague approaches the small fire. Seemingly magical in nature, he watches as it begins to take a human-like form. Superman has the tanker in the air now soaring above the city, he passes over the Astrodome issuing an ultimatum to the robbers. Unfortunately he isn't able to finish as the Astrodome erupts into flames taking the truck with it. Hurled back and in shock, Superman tries to get his bearings while below the flurry of journalists and cameramen continues to grow. At first there is distrust, akin to the days Superman first appeared, the public assume he blew up the truck and took down the Astrodome at the same time. Perry isn't confused as a beam slams into Superman's chest. Nor Lois when the news copter footage streams in. Superman didn't do it, he's being attacked by a creature. As the flames begin spreading across the city Lois orders the copters and Jimmy to pull back out of harm's way as Superman flies in fighting the flames with his arctic breath. The creature mumbles the work "Krypton" before hurling a comet of flame towards the people below. Superman uses a billboard to absorb the fiery ball but he watches in horror as a police helicopter explodes. Lois screams over her mic for the news teams to pull back. 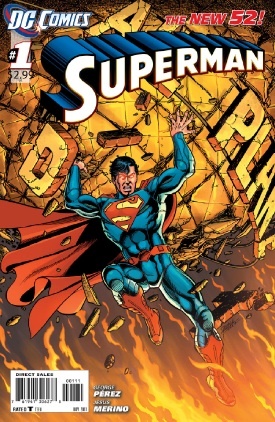 Lt. Casey hears of the Police copters destruction back at the precinct and he too, despite wanting to get involved, tells his team 'this is a job for Superman' and what a job... Superman formulates a plan and heads to the site of the old Daily Planet. Morgan Edge is displeased and calls Lois at the studio. Back in the day Lois wouldn't hesitate staring death in the face to get a story. Edge hired her because of that and her management of the news team has left a bitter taste in his mouth. Lois stands up to Edge, she's still the same reporter and will do whatever it takes to get a story, but she has a team now, and�responsibilities. "My Show, My Call" she blasts him before cutting him off. Lois patches in to Jimmy and Miko, instructing them to piggyback the CCTV cameras near the action so they can still see everything without reckless endangerment. Her�resourcefulness�proves successful and they begin an emergency broadcast. Meanwhile Superman has retrieved the Planet's original globe. The creature was so good at hurling fireballs, but could he catch? The distraction provides Superman the�opportunity�to get close to the creature and with blazing speed the two aliens hurtle into space. With no oxygen the creature promptly dissipates and so does its influence on earth. Lois saves Jimmy & Miko from jail for their illegal tap with a quick call to Lt. Casey, PGN has astounding first night ratings thanks to Lois' coverage but the shining beacon of truth and justice comes from Clark Kent with an insider story on the entire night's events. So insightful a story, it's almost like he was right there in the action. Clark meanwhile is too busy to celebrate, instead he makes his way to Lois Lane's apartment. An apology is due and it's one that can't wait, however a�disheveled Lois answers the door. The two make peace and�Clark is about to stutter something more when he is interrupted by a half naked man. Jonathan Carroll, introduces himself then leads Lois back inside to celebrate in bed. Clark walks away, overhearing Lois and Jonathan discussing their 'undefined' relationship and how Clark was a loner. As the hall lights dim down Clark steps into the elevator and leaves. Story - 5: OK let's get it over with. The changes? The Daily Planet is part of super corporation PGN, Jimmy is now a brunette with a geeky sidekick, Maggie Sawyer and Dan Turpin are replaced with Lt. Casey, Morgan Edge is black, Perry is (a bit) younger and has a new boss, Izzy. Clark is scruffy haired and opinionated. Lois is much higher on the corporate ladder and equally opinionated. Superman is cocky and swears (mildly). Clark is hopelessly in love with Lois. The changes, aren't that big of a deal to me besides the Daily Planet becoming an allegory of News International and the battle DC is having with print and digital in the real world. I'm sure the comments and message boards will be chock full of varied opinions. I myself am pretty happy with the book. How they get here from the story running in Action Comics is what I'm keen to find out.�Perez weaves an entertaining story retelling that retains much of the heart of Superman while going a long way to ensure both the Man of Steel and the Daily Planet can survive in the modern world. The relationships are something I'm not sure about, I hope that they don't stay as divorced as this.�Those of you old enough to remember might want to watch the last few episodes of Lois & Clark's first season. This story definitely resonates with the time Lex bought the Daily Planet and Lois became a broadcaster. I am puzzled by the team dynamic, perhaps that is first issue shell shock but they were previously part of a work team that was interwoven with each other on a daily basis. I just don't see how they'd work together anymore unless brought together by an occasional story. Lois & Clark won't be an investigative team, Jimmy has a team of his own. Perry will be around Clark and Ron but won't have many dealing with Lois. I am glad however that Lex was absent, I think especially in this issue he would have perhaps diverted much of the limelight. I need to shake the feelings off and fully embrace the changes though I'm thinking it will take a few issues to settle down.�I like that Superman had a youthful enthusiasm. He's resourceful, smart and though a force for good isn't as sanctimonious as he was in times past. Thankfully his depression is to a minimum and specifically surrounding the fact he can't seem to make Lois notice him beyond a talented but lonely writer. I loved the fact a writer has been talented enough to write about the characters. A snide comment? Of course it is. Over the past ten years how many stories can you count that looked at Lois, Jimmy, Perry and especially Clark as anything more than two dimensional 'side issue fodder' to Superman's latest smack down with Lex or a villain. I hope the PGN staff take a much bigger role in this new series. This first issue has me filled with optimism. Art - 4: The art was frustrating. Digital�coloring�is really killing some comics and here it makes for a frustrating mix. There is a LOT of story packed into the issue and to facilitate that the artwork is tight, averaging on 12 panels a page. That kind of tightness in artwork usually makes a fantastic read. A mutually beneficial marriage for the reader but the art here is�asphyxiated by the colors. There is just too much going on. I may be alone in this but the book could have done with a boost from twenty five pages to thirty six, greedy maybe but I would have liked the artwork to have had space to breathe. Cover Art - 5: I was sold on this when I saw it way back, the 'battle armor' isn't so pronounced and Superman looks, well, Super! With the addition of having read the story now, having him with the original globe has me cheering him on.